Well the raging war of Apple & Android will never standstill even after 10 years onwards, however deep down you adore an iPhone, you choose an iPhone, you flaunt your iPhone as it has become a status symbol of course, and people love to get a new iPhone every year like a typical ritual. Apple has a huge market and their way of launching their new gadgets/devices is creditable; hats off to the team that works round the year to bring out the best of all tech devices which may be copied later on and imitated by other leading brands but they can never attain the finesse and classiness of Apple. That is why Apple charge mighty dollars for it. But surprisingly you can have iPhone 8 and iPhone 8 Plus comparatively in lesser prices. There is not much of an upgrade and change in these iPhones and they actually look like a prototype version of iPhone 7 and 7 Plus. However the stealer of the show was iPhone X which is such a colossal upgrade having great and totally different features. We will discuss it later. Let me throw a little spotlight to the INS & outs of iPhone 8. It comes with a total glass design with a better camera quality, available in Gold, Silver and Space Gray, also with no surprise it is dust and water resistant as ever. The most advanced thing you will notice is that it has wireless charging, so you would totally be carefree for cords and wires being messed up, tattered down or broken. It has 4.7 Retina display that gives a vigorous touch to the glass design of iPhone 8. You can honestly capture the most stabled, finest, cooler videos/photos with 12MP camera, having a range of portrait filters as well, and the blurred backgrounds will make your pictures breathtaking. A11 bionic chip is the most advanced and smarter chip ever in a smartphone. What more will you want other than this? 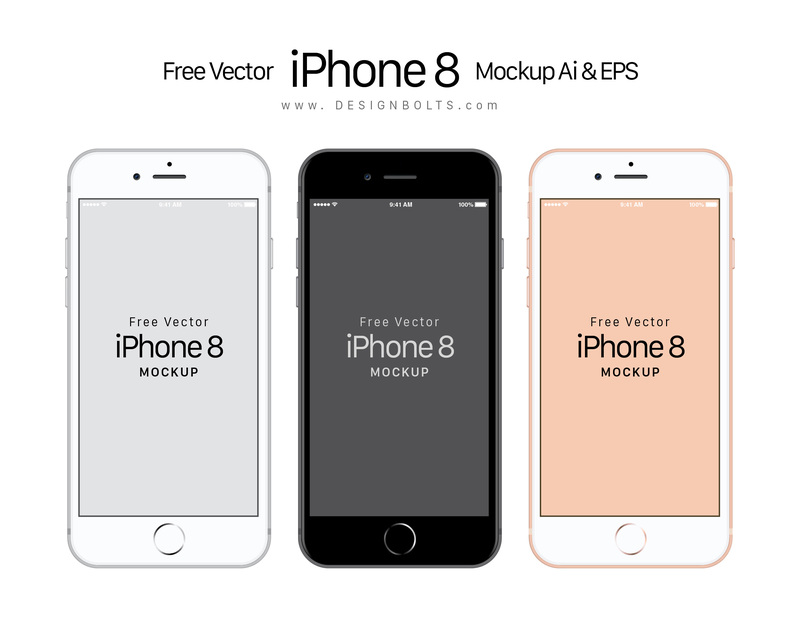 Down here I am giving away a free Vector Apple iPhone 8 mockup that can be practiced in both commercial and personal tasks/projects. For more tech and design trends do not forget to subscribe us.